Acanthaceae. Zones 8-11. 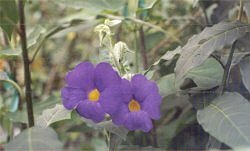 This is a true vine in tropical climates, treated as a perennial in colder zones. It is a tall, scandent herb to vining climber, which has oval-elliptic leaves to four inches long, palmately nerved. Flowers are produced in axillary racemes, a striking blue in color. Full sun to afternoon part shade, well-drained, organically enriched soil. Pine needle mulch recommended for winter in Zones 7 and 8.